This week was a great week full of wonderful finds! We started off the week by traveling to Central Oregon and found loads of mid-century furniture there (click here for the full post on those finds). 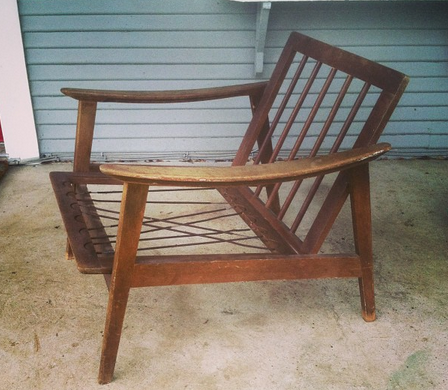 Chris found this great lounge chair frame from a local vintage shop. It obviously needed TLC and cushions and we've gotten pretty good at completing lounge chairs quickly. Chris loves these alligator heads. Awhile ago when we use to only sell out of our home, we had a few of these staring at me every time I walked in the door. They always sell quickly here in Portland. I'm happy that someone else can enjoy those creepy eyes. 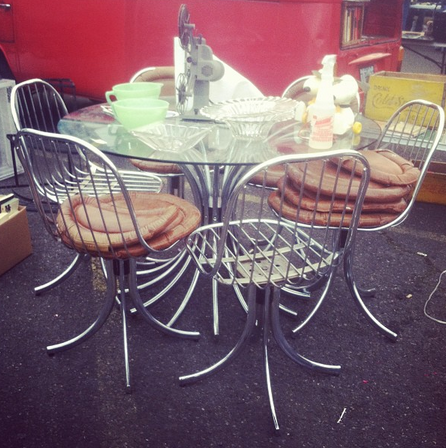 I couldn't resist including this picture of an amazing set of chrome dining room chairs that we spotted at a local flea market. But alas, we don't have the room for them and they were a little too steep for us. But those chairs are fantastic! Three times a year, there is a flea market called Plucky Maidens. Usually it's a much to shabby chic for us, however, we've found that if we go early, there are a few mid-century finds to be had. 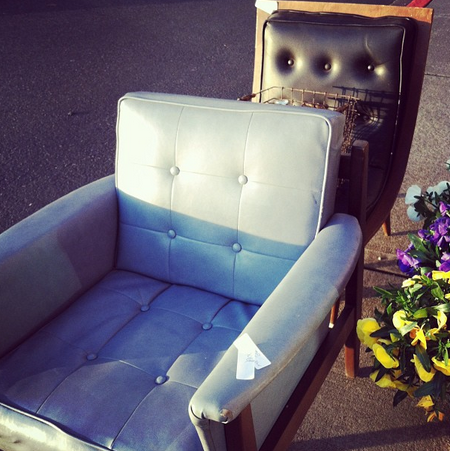 Here's a pic of a few of those finds: a scoop chair, and a pair of these blue club chairs. 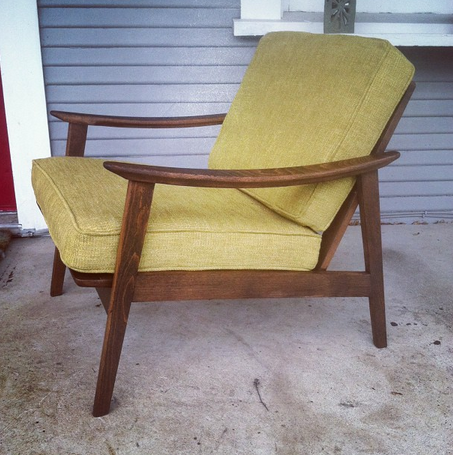 Does anyone notice a similarity between that chair and the love seat I just finished?! They are exactly the same! Too funny! I plan to reupholster them in the same black vinyl that I used for the previous love seat. Finally, this find is a lot out of our regular buys, however, I knew that it was too good to pass up. 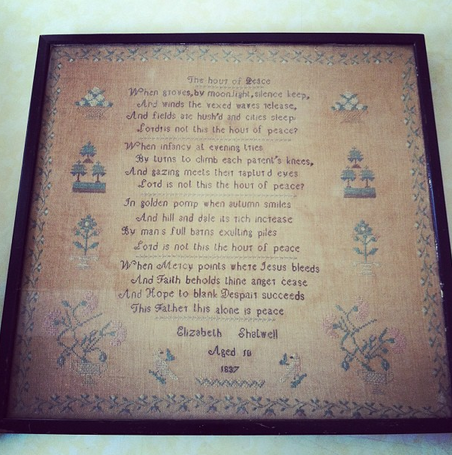 It's a needlepoint sampler by a 10 year girl from 1837. Isn't it incredible the skill level of young girls from this period? I'm currently researching these samplers, the prices are all over the map. Are there any sampler gurus out there that could help out with price and info on pieces like these? Glad I found your blog, I love all the mod inspiration! 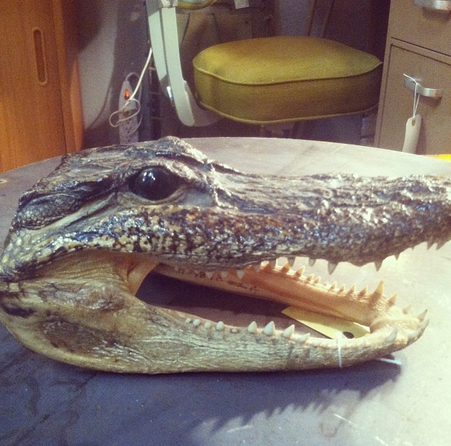 I wish the gator heads sold as well in Florida, I have an inherited one chilling at the house but gators are everywhere here. I love the huge creepy eyes on the one you found. And all of the beautiful furniture, of course. Thanks for the shout out! Love the lounge chair... My Chris and I really need to try our hand at refinishing and making cushions for the one we bought; you make it look so easy! Have you guys ever done a how-to post about that? Where'd you go in Central Oregon? That sounds like a blast! When Chris and I were visiting my family in Portland last year, we went out to Bend for a few days to ski, but we also went to every thrift store we could find (of course), of which there were many, and came away with tons of great things. Not nearly as amazing as your furniture finds, but we couldn't exactly fly home with that kind of stuff! You are the fastest when it comes to restoring furniture! How do you do it? I wish I knew how to saw. Fantastic finds as usual. It's amazing what you can do with a piece of neglected mcm furniture. That chair looks fantastic. Love the sampler - so sweet. Thanks for the link up. I'm jealous that first chair is a real keeper.